By Costa Maragos Posted: September 21, 2017 6:00 a.m. The research of Swati Mehta, a post-doctoral research fellow in the Psychology Department, has received a national honour. The Royal Society of Canada has awarded Mehta the Alice Wilson Award for her work to improve access to mental health services for people with spinal cord injury. The award is given annually to three women with outstanding academic qualifications at the postdoctoral level. 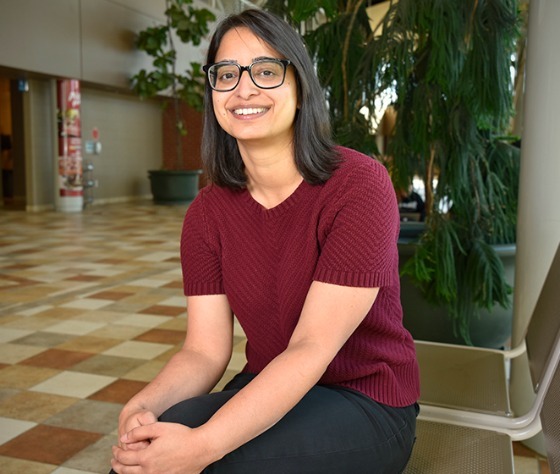 Mehta will examine the effectiveness of the U of R’s internet-delivered cognitive behavioural therapy course for persons with spinal cord injury. The course is a collaborative effort between the University’s Online Therapy Unit and the Centre for Emotional Health at Macquarie University in Sydney, Australia, who originally developed the course materials for use in online therapy. Mehta completed her PhD at Western University in London, Ontario, in the Faculty of Health and Rehabilitation Sciences and a master’s in counseling psychology. She was attracted to the U of R thanks to the groundbreaking work the University’s Online Therapy Unit led by its founder, Dr. Heather Hadjistavropoulos. Right now Mehta is seeking people to take part in her study. She’s contacted spinal cord injury support groups, specialized rehabilitation units, and community clinics. If you or someone you know has experienced a spinal cord injury please visit the Online Therapy Unit website here to register for the course. Mehta’s research has attracted attention from Canadian funding agencies. She has been awarded a two-year post-doctoral research fellowship from the Canadian Institutes of Health Research and a post-doctoral award from the Saskatchewan Health Research Foundation. Mehta’s recognition by the Royal Society of Canada puts her in impressive company. On September 19, the society announced 12 medal and award recipients of varying disciplines. To view the recipients please visit here.